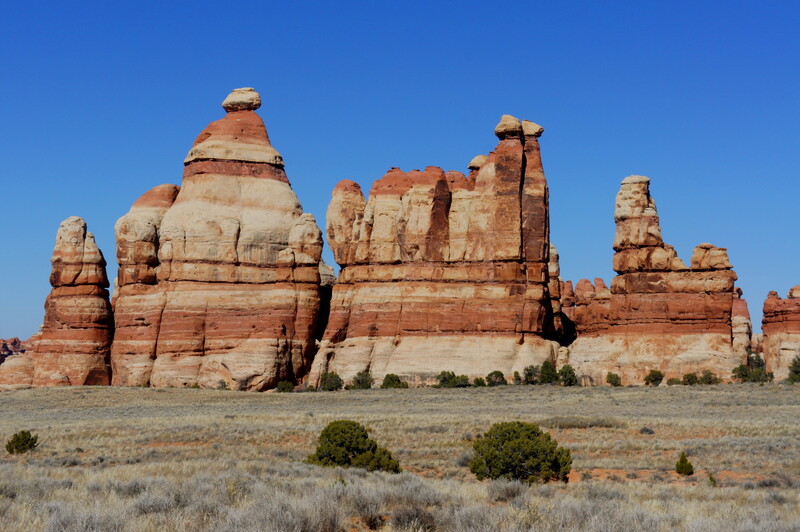 The Needles District in eastern Utah’s Canyonlands National Park features a maze of towering pinnacles, winding canyons, and mushroom rocks—and the Chesler Park Loop winds through perhaps the best of it. 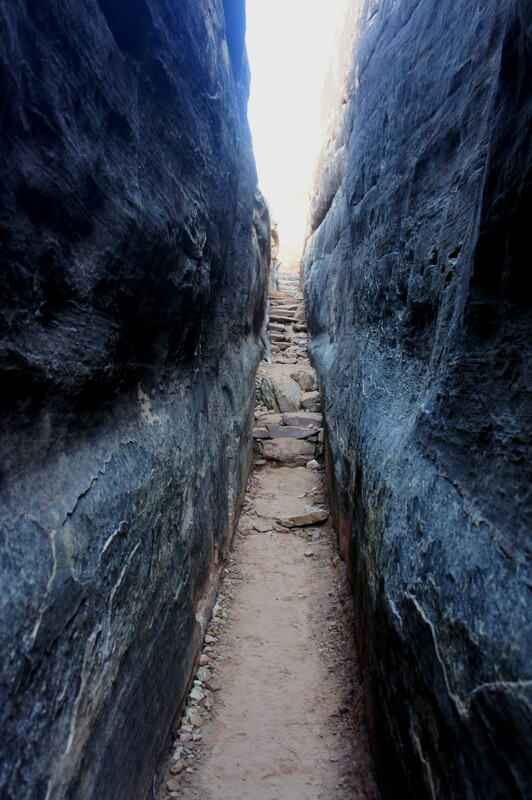 The roughly 11-mile stem-and-loop circumnavigates a grassy plain flanked by slickrock spires, while a short section of the “Joint Trail” edges through a narrow cut resembling a smooth slot canyon. The approach section—three miles one-way from the Elephant Hill Trailhead—is also no slouch: highlights include slickrock expanses, tight passages, and a beautiful descent into Elephant Canyon. 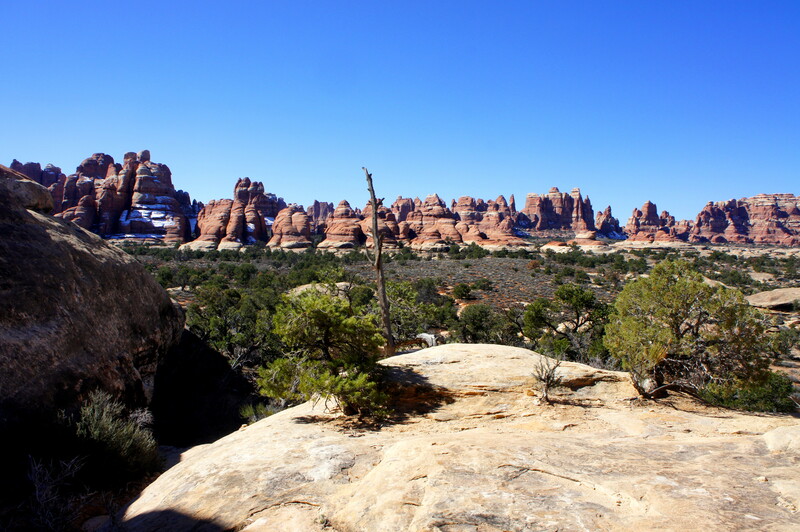 The route is well maintained, but the considerable length and numerous ups and downs make Chesler Park a strenuous day hike—or, better yet, a multi-day adventure. Even from Moab—the tourist hub of eastern Utah—it’s at least a 1 1/2-hour drive to the Needles District of Canyonlands National Park. The remoteness is partly dashed by the flurry of hikers and backpackers who flock to the district in spring and summer, but a couple miles away from the main roads, crowds thin significantly. 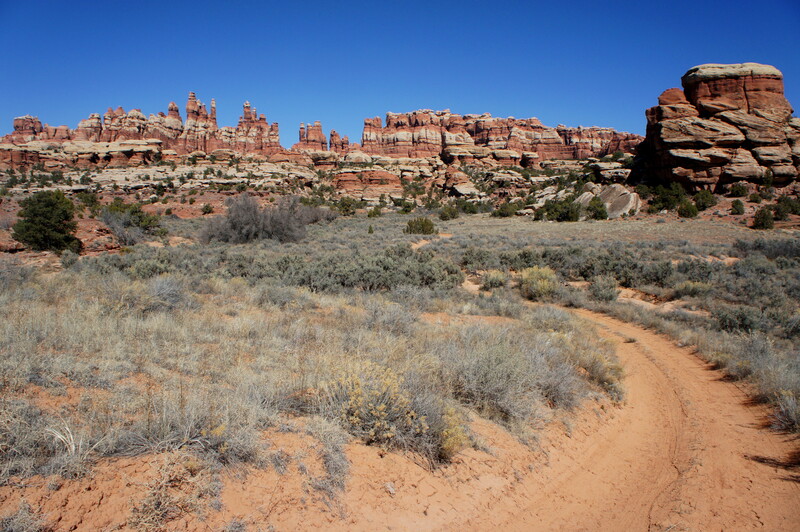 Chesler Park is best accessed from the Elephant Hill Trailhead, located at the end of the 3-mile Elephant Hill Access Road, an unpaved but well-maintained track usually passable to two wheel-drive passenger cars. There are picnic tables and pit toilets at the trailhead, which also doubles as the start for the rough, four wheel-drive track up Elephant Hill. The Elephant Hill Trailhead is located at the head of a box canyon, a tributary of the much-larger Big Spring Canyon. While the Elephant Hill Road begins a sharp climb to the right, the Chesler Park Trail edges off to the left. A sign with a small map of walks in the area marks the beginning of the trek. Almost immediately, the cairned route ascends sharply up the canyon’s southern slope. 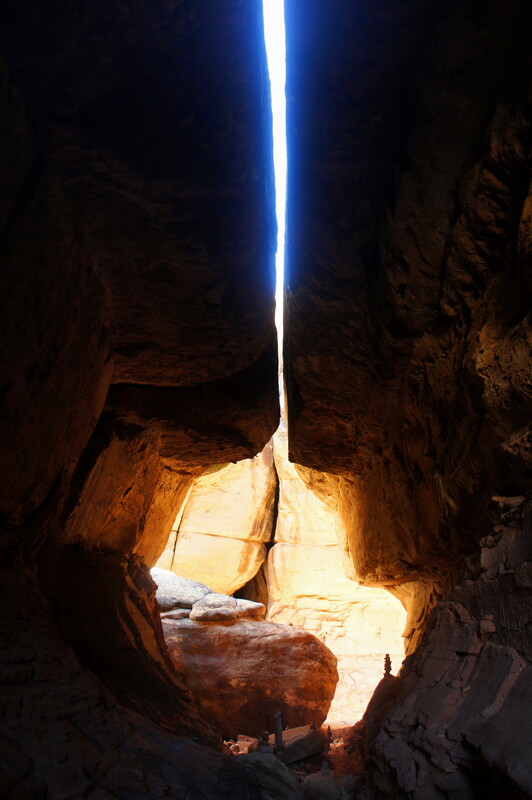 Within a couple minutes, a lengthy staircase cuts through a so-called “joint” in the sandstone. The trail gains more than 100 feet in less than 2/10 mile before abruptly leveling out atop a stony basin, affording views back to the north and east of the entrance ravine. Fragile cryptobiotic soil is ubiquitous. 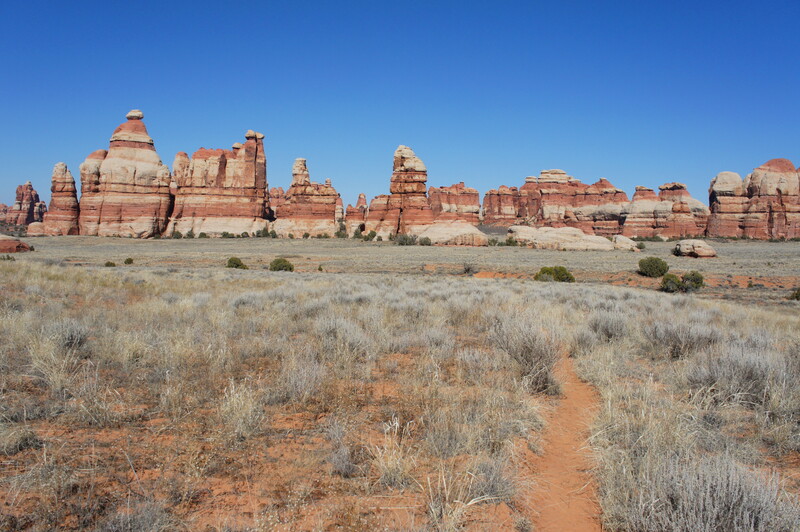 The southbound trail alternates between sand and slickrock as it follows the western flank of a series of orange and tan buttes. 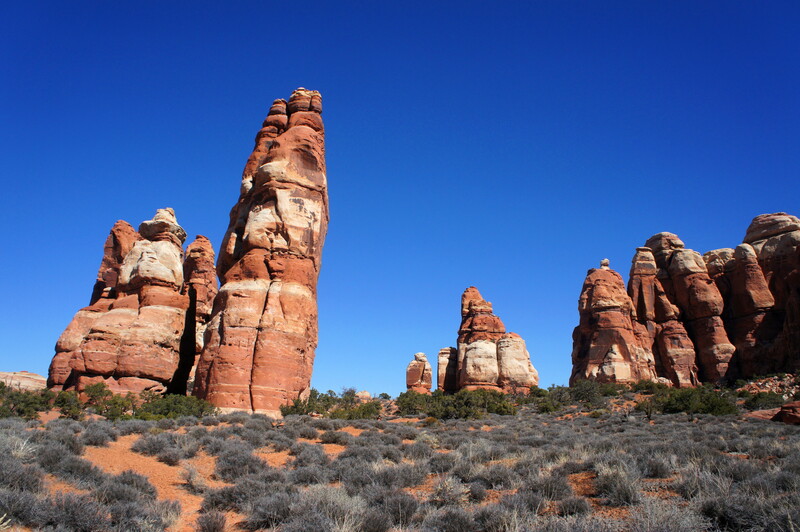 The rocky promontories in the Needles District are predominantly composed of tan-to-gray Cedar Mesa sandstone, which interfingers with red arkose of the older Cutler Formation to form multicolor knobs, horsts, and of course, the spiny “needles” themselves. After a short period, the route skirts the edge of a canyon 40-50 feet deep that is chock full of plump spires with tan-colored caps and scarlet underbellies. 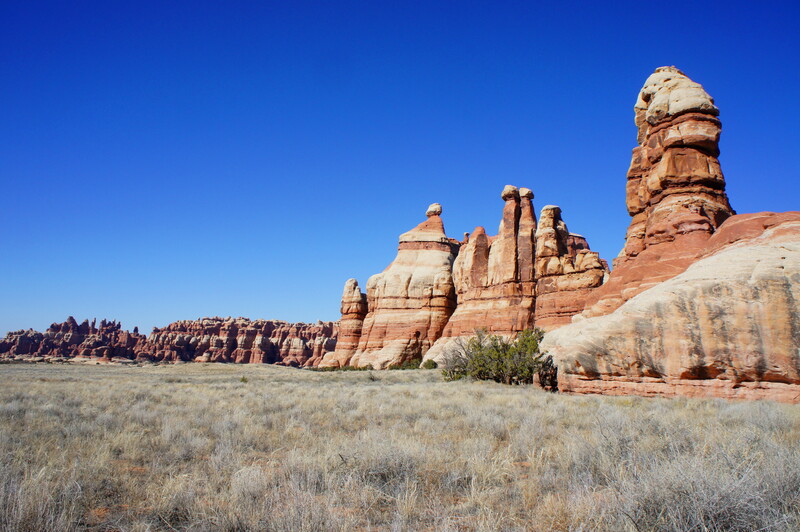 Off to the east, the horizon is dominated by high walls of red-orange Wingate sandstone; beyond are the pointed peaks of the La Sal Mountains. It is about ¼ mile walk across a sandy blackbrush flat to the first of more than a dozen trail junctions. Trail signs at all junctions are neatly arranged by destination (Druid Arch, Squaw Flat Campground, etc.). Bear right; from this point, it is another 1.4 miles to Chesler Park. 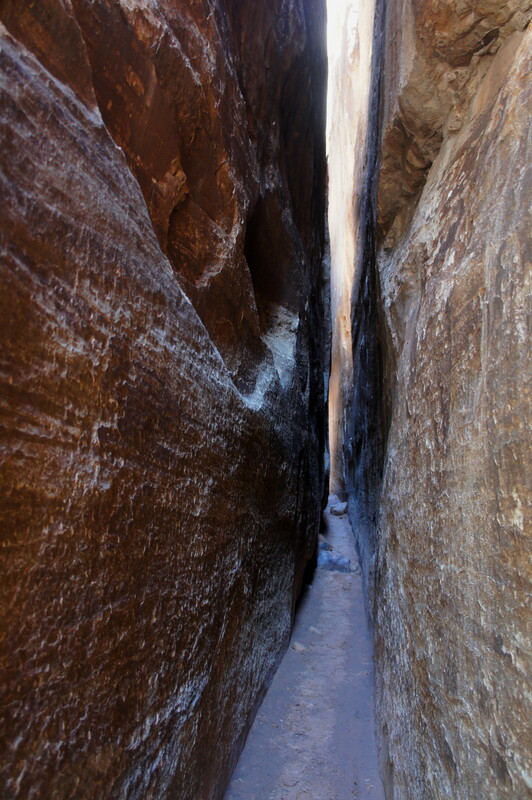 The route beyond immediately climbs a slickrock slope before negotiating a short, shady, and thinly-cut joint. A new set of needles is visible to the southwest just beyond. Within 5-10 minutes, Elephant Canyon becomes discernable to the north and west. All of a sudden, the trail passes through a much deeper and darker joint, where a steep descent is facilitated by the presence of stony steps. Here the walls are less than three feet apart—a flavor of the eerie passages to come. The joint section is followed quickly by a tunnel-like grotto, with green vegetation and nicely varnished overhangs. 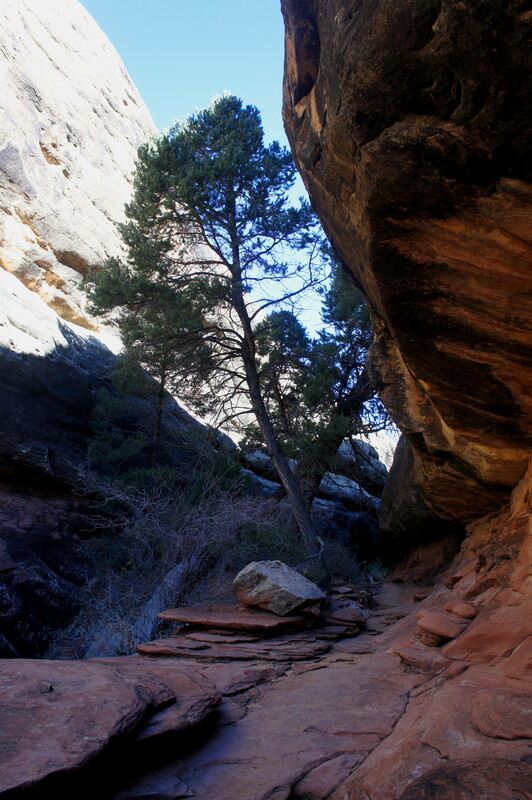 This minor ravine is a tributary of Elephant Canyon, and the trail thereafter begins a steep descent down to the canyon bottom. A seemingly endless array of mushroom knobs lines the wash on either side. After crossing the sandy bottom of Elephant Canyon, you will find a second trail fork. A well-traveled path leads south from here into the drainage’s upper reaches and toward spectacular Druid Arch. 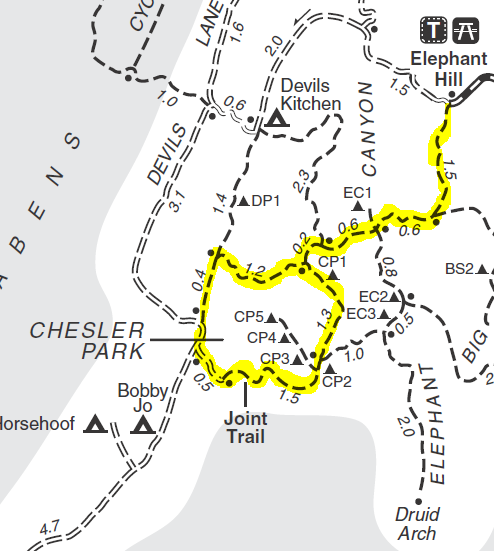 Bear right to follow the most direct route to Chesler Park, at this point another 0.8 mile beyond. Take a breather, as the trail will soon begin a steep climb up a rocky gully to escape the Elephant Canyon system. The ascent, clearing several impassable dryfalls en route to a sagebrush flat, gains perhaps 150 feet and takes around 10 minutes to complete. As the path approaches an imposing set of needles to the southwest, hikers will encounter a third trail junction. Bear left—Chesler Park is near. Third trail junction–Chesler Park is near! The next 0.2 mile is quite steep and strenuous as the trail gains a low ridge between towering pinnacles. Fantastic views of Elephant Canyon and the Needles unfold back to the north. At last, 2.9 miles from the trailhead, the rocky route crests the notch and offers the hike’s first views of Chesler Park. A short spur to the left climbs to a nice viewpoint of the landscape ahead—a sublime grassland surrounded by needles, with the steep slopes of Beef Basin and The Grabens beyond. (Note: in winter, views are likely to be diminished in part by the south-hanging sun.) Many day-hikers will end their journey here, heading back the way they came. The persistent will carry on, rewarded with even better vistas. 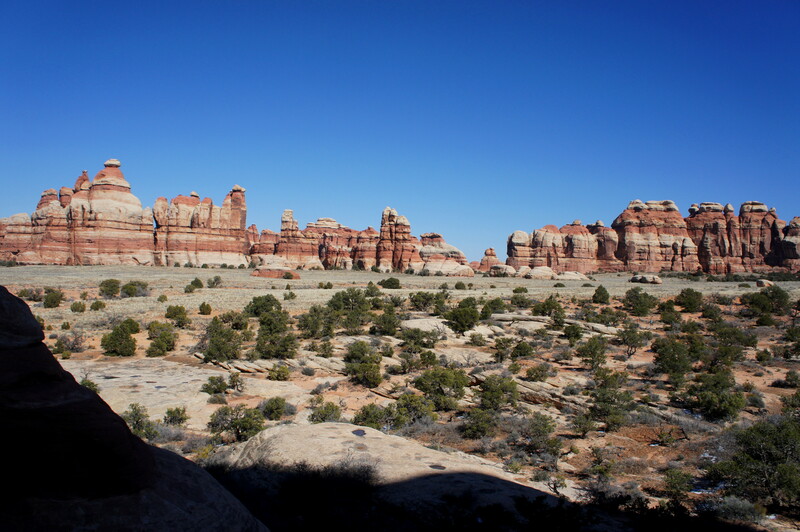 Beyond the overlook, the trail descends gradually into Chesler Park (past a small arch high up in the needles on your left) and forks again at roughly the 3-mile mark. This is the beginning (and end) of a roughly 5.2-mile loop around the grassy basin. Turn right first, saving the most intimate views of the impressive west-facing needles for later in the day, when illuminated by the afternoon sun. Follow the signs for the “Devil’s Kitchen” campground—though the route will curve left before reaching the namesake destination. The 1.2-mile section that follows skirts the southern flank of a dense set of needles, passing once through a narrow joint. From a couple of open slickrock expanses, hikers will be able to spot the sandy Elephant Hill Road down in grassy Chesler Canyon to the southwest. Eventually, the winding trail will take you there. Approximately ¾ mile into the Chesler Park loop, the route forays briefly into a shallow ravine. One slickrock slope dropping about 30 feet could give pause to some hikers but is relatively easy to navigate with switchbacking and secure footing. The descent is fleeting, as shortly after entering the ravine, the route turns northwest and begins climbing an adjacent drainage back toward the rim of the Chesler Canyon system. At the trail junction, bear left following a sign to the “Jeep Road” 0.4 mile away. After the false start in the last section, the trail in this section drops into Chesler Canyon, a subtle depression that feels more like a spacious grassland than a deep-cutting gorge. During the descent, one small ravine harboring a slightly ominous joint presents a small obstacle with some minor exposure. The cairned route drops to a broad, sandy wash before quickly leaving it on the left-hand side. The jeep track is just ahead. Upon reaching the road, there are no signs indicating which way to turn—but it is apparent upon glancing at a map that bearing left continues the counterclockwise loop. It is roughly 0.2 mile up and over a small hill to a more obvious junction marked “Chesler Park Trailhead.” Turn left here. 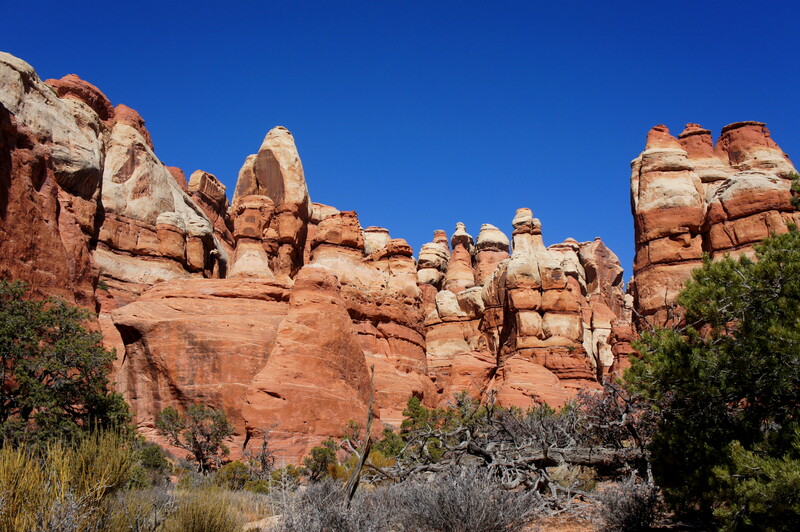 The Joint Trail, a scintillating 1.5-mile section of the Chesler Park loop, begins from the end of the road. 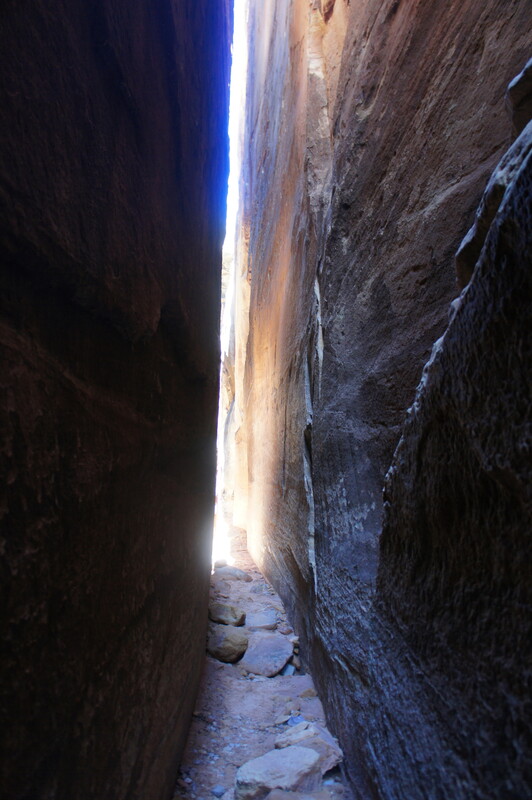 It is 0.6 mile—up Chesler Canyon, across a broad wash, and through a crop of sandstone knobs—to the “joint,” a narrow passage between stony outcrops reminiscent of a slot canyon. A cobble staircase ascends a narrow crevice barely two feet wide, providing access to a spooky chamber that nearly forms a fully enclosed tunnel (light shines through a thin slit in the top). Hiker-made rock cairns of impressive height scatter the bedrock bottom. An abrupt left turn around a huge boulder leads to a relatively open area before the ravine quickly narrows again, in some spots so slender that backpacks must be removed and carried by hand. The joint is impressively straight, bending only ever so slightly to the left and right, and bisected in almost perpendicular fashion by adjoining joints that are even thinner and darker. One obstacle—a minor boulder jam—is, as of this writing, easily surmounted by climbing a sturdy, chiseled log placed at the base of the obstruction. The joint section lasts around 300 yards before abruptly reemerging into the light along the southern fringe of grassy Chesler Park. 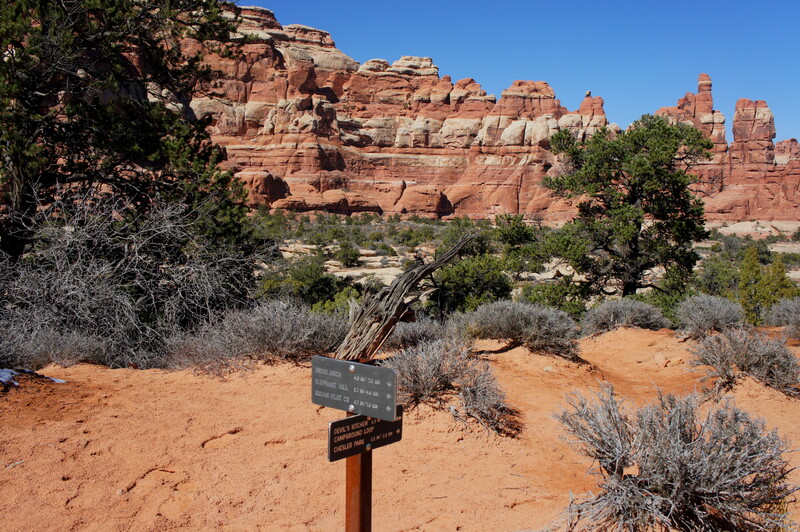 Here a trail sign offers a litany of options—left back toward Elephant Hill via the rest of Chesler Park, right back through the Joint Trail, or straight ahead to a fine viewpoint well worth a minor detour. Reaching the overlook requires ascending a series of undulating slickrock slopes, but the sharp climb is assisted by the presence of Moki steps. The spur ends atop a bench overlooking Chesler Park. 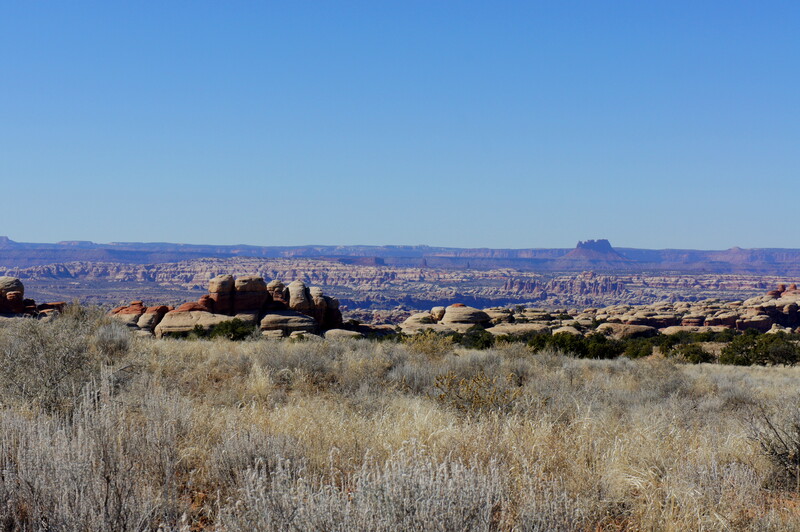 To the northwest, one can see across the Grabens and the Colorado River to Canyonlands’ Island in the Sky and Maze Districts. In the foreground to the west, you can scan from above the narrow impression of the joint through which you just passed. Return via the 500-foot spur trail to the signed junction at the end of the joint and continue east (right), reentering the grassy basin of Chesler Park. Some of the finest views are found in this section, especially as you approach a particularly intriguing crop of needles to the northeast. Unlike the majority of the stony spires flanking the edges of Chesler Park, this smattering of pinnacles sits right in the middle of the flat plain. 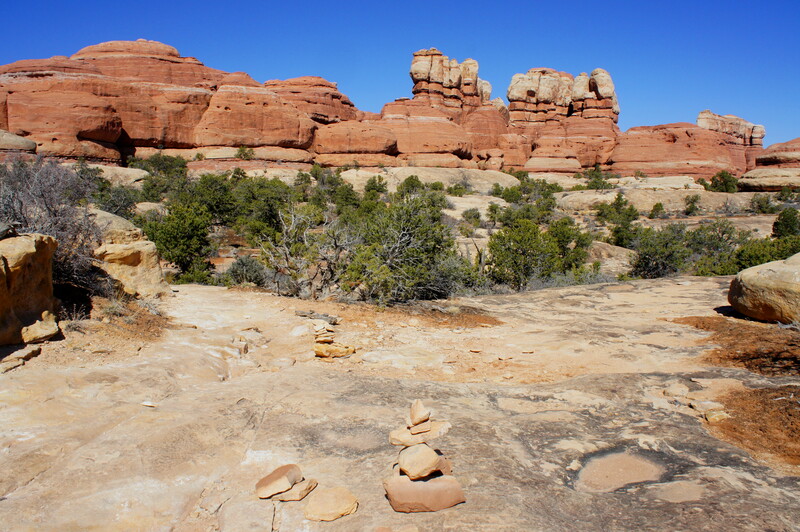 Roughly seven miles from the start of the hike, the Joint Trail ends at a point where the trail edges the southernmost of these needles—a number of excellent campsites can be found in this area. Day hikers will continue on for another 2/10 mile to yet another trail junction—bear left in the direction of Elephant Hill. The trail beyond traverses a sunny field toward a line of needles to the northeast. A scenic notch just over ½ mile from the junction provides a window back down into Elephant Canyon to the east. From here it is another ½ mile to the start of the Chesler Park loop and the 3-mile approach route back to the Elephant Hill Trailhead. Turn right, crest the low pass to exit Chesler Park and return to Elephant Hill the way you came. The entire 11-mile stem-and-loop deserves at least a full day, if not two or three, to complete. 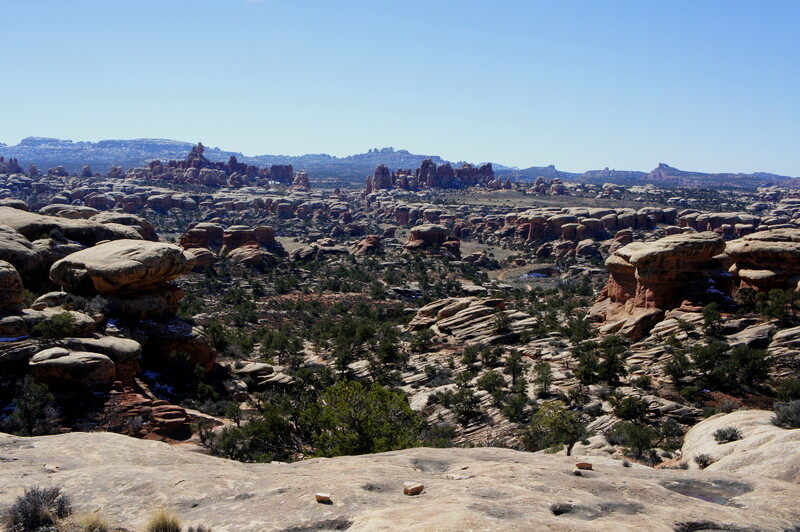 This entry was posted in Canyonlands National Park, Strenuous Hikes, Utah and tagged Big Spring Canyon, canyon, Canyonlands, Cedar Mesa sandstone, Chesler Canyon, Chesler Park, Chesler Park Trail, Elephant Canyon, Elephant Hill, Joint Trail, loop hike, Narrows, Needles, spire, Utah. Bookmark the permalink. We just completed this loop last week while staying in Moab. We had completed the hike previously two years ago but got a late start and had to rush the second half to get out before dark. So a return to enjoy the entire route was necessary this year. What an amazing hike! We rank this as one of our favorites for the continuous views and variation of the trail. 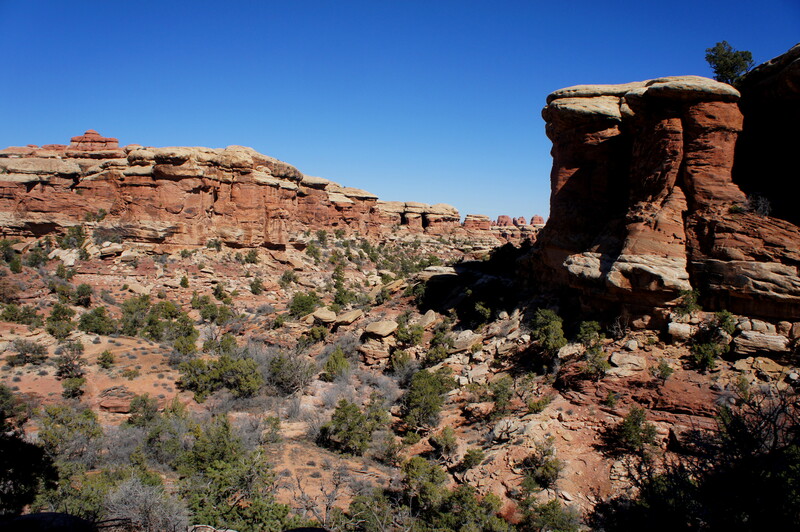 I found your blog while looking for info on the Meeks Masa Trailhead outside Capital Reef. We have returned to Capital Reef area to complete a few hikes we missed last time and to see friends. Our weather has not been very favorablefor long hikes, canyons, or dirt roads with storms predicted for every afternoon. Thank goodness we did most of the Jeep roads last visit. So we are getting in a few short hikes to things we missed two years ago. Great directions and photos showing the way! Fantastic! Hope you found this blog useful – I’ve added yours to my blogroll on the right-hand side of the home page. Looking forward to reading more about your adventures! We would like to take this hike when we go to Canyonlands in a few weeks. However, the length of 11 miles is likely too much for us older folks. Great post. Thanks for the information. Awesome! Glad my post was helpful. Great blog! Thanks for the info. I am looking to do this hike in August when I am in Moab. Do you think I can get it done before it gets too hot if I am on the move before sun up? Hi Gerald – yes if you get up really early! 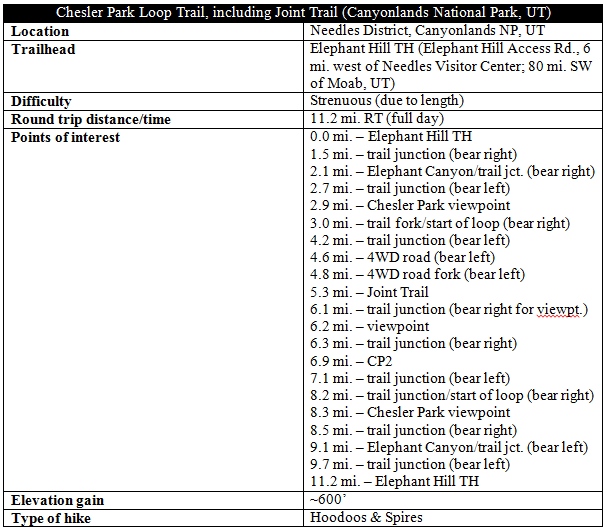 Keep in mind it takes about 1 1/2 hours to get from Moab to the Needles. I will travel in the USA for the 8nd Time in April and I definitively want to hike this trail with my 8 friends. Your blog and articles are very useful, thank you very much !! One question : What’s the better hour to begin the trail in April ? Bonjour! Je recommande que vous commencez la randonnée assez tôt au matin parce que c’est une longue journée, especialement avec huit amis!